The mass demonstrations have continued in the centre of Paris over the last two weekends despite the fact that French authorities have banned rallies on the Champs Elysees and in its vicinity in March. The protests, triggered by the government's plan to raise fuel taxes, have been ongoing in the country since mid-November. 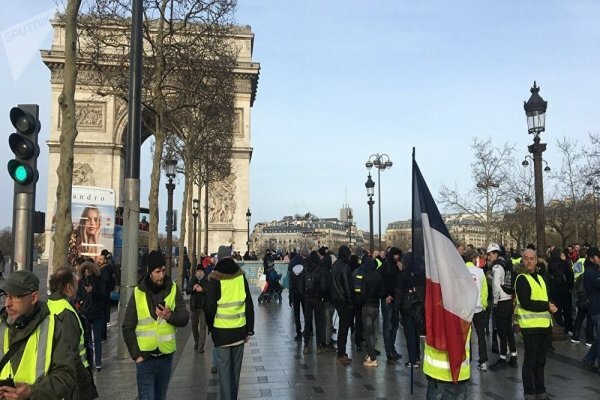 The authorities gave up on their fuel tax increase and have offered several other concessions, but the Yellow Vests keep gathering in cities across France.Follow Sputnik's Live Feed to Find Out More! The rallies continue in Lille, Rouen, Lyon, Montpellier and other French cities. According to French media, clashes between protesters and police have erupted in Toulouse.